Jeeze. Han really was a scoundrel, wasn't he? That's interesting. I like that they're adding new female characters, romance or otherwise. It would make sense that he would have a different love (hate? con?) interest(s) as he didn't meet Leia until he was older. I can see the Han/Leia fans freaking out, though. I hope we gets lots of young Chewie and Lando. Maybe they'll cast both women and Han will get yelled at a lot lol. @MoonlitMoss wrote: Jeeze. Han really was a scoundrel, wasn't he? That's interesting. I would love this!! I have this head canon of Han escaping the Sultan of Boz Pity's palace chased by Princess screaming "wait for me", angry sultan and guards in pursuit.....then he jumps out of a window onto a speeder driven by Chewie, Sana and Lando....and they drive off with Lando congratulating him, Sana scolding him and Chewie making snarky remarks in wookie. That is a really good point....even if it makes some fans a little angry to see other women in Han's life (friends, enemies, lovers, team members), I'm glad also to see more female characters being brought into the story.....while the EU had plenty of female characters in novels and comics, few made it to the movies. Donald Glover has just been officially announced in the role of Lando Calrissian! Mrs Ben Solo wrote: Donald Glover has just been officially announced in the role of Lando Calrissian! Love that casting. 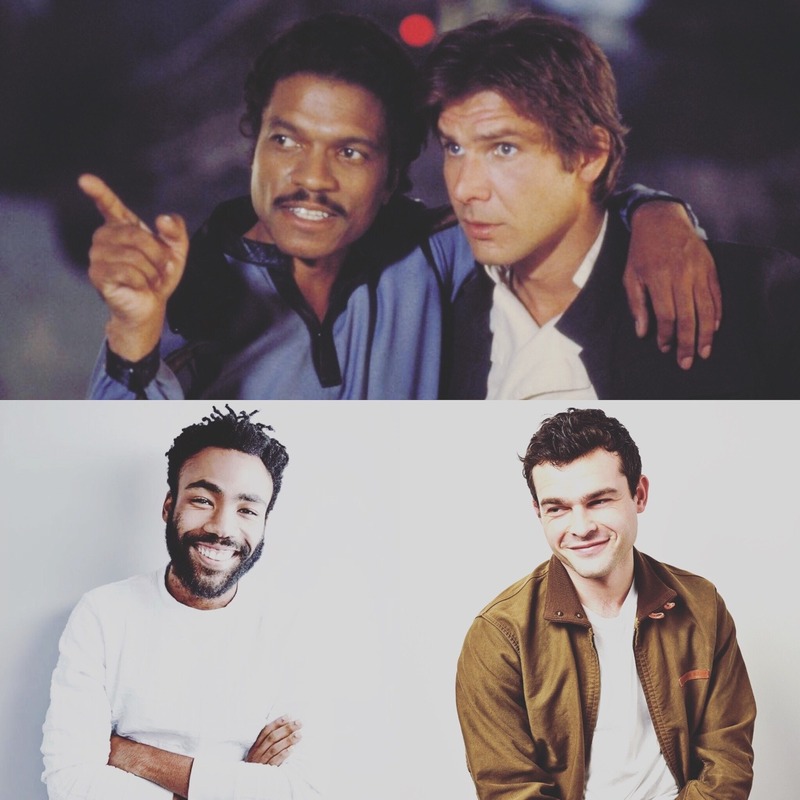 I have no doubt that he can pull of that Lando charm. He's pretty great & if you aren't watching Atlanta, highly recommend it However a tiny part of me was hoping for Key & Peele's version of Lando. he looks spot on Lando, has the same type of charm and even physical resemblance. Way better than Ehrenreich/Ford. 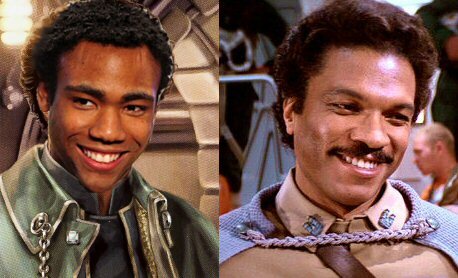 Although I'm going to miss Billy Dee as Lando, I think Donald Glover as young Lando is awesome casting. I'm really happy with the choice. Initially I was a little leery of a young Han Solo movie without Harrison, etc., but in the last few months, the idea is slowly growing on me. I'm still a little sad that they're doing a Han movie without Harrison, but I'm open to seeing where it goes. Is Han/Lando (Hando?) already a ship? Because I feel like it's gonna be with this movie...Donald Glover is beautiful. One of the greatest bromances of all time. Damn you, Lucasfilm. You know how to sell things to me, don't you. I am just a little more pumped over HS movie than R1. Looking forward to good laugh, some action, a lots of space criminals and Chewie. join the upcoming untitled Han Solo Star Wars movie. Clarke’s role will round out a dynamic cast of characters that Han and Chewie will encounter on their adventures. Clarke joins Alden Ehrenreich and Donald Glover — previously cast as Han Solo and Lando Calrissian, respectively — in the highly-anticipated film, which is set prior to the original Star Wars trilogy. Hopefully Emilia is great in whatever the role is, but I'm a little disappointed because I thought this role was going to be a woman of color. A while back, there were reports that Tessa Thompson, Zoe Kravitz and Naomi Scott had all tested - and they were the only names mentioned at the time. Heh, I was hoping for Sana Starros to be in the movie, and yet we got another brunette in SW. Like, I have nothing against brunettes, being a brunette myself (lol), but even a redhead would have been a nice change. Anyway, since we got another brunette in the GFFA, let the Rey-Mother-of-Dragons parentage theories begin. @Irina de France wrote: Heh, I was hoping for Sana Starros to be in the movie, and yet we got another brunette in SW. Like, I have nothing against brunettes, being a brunette myself (lol), but even a redhead would have been a nice change. Yeah,nothing against Emilia she might be great for the role but I think LF shouldn't get irritated when people start speculating that this or that character can be Rey's mom when they keep casting white brunette women to play those roles.I mean come on would it kill them to cast more POC actresses in main roles? I for one would like to see Rae Sloane on a live action moive and this time Disney won't be able to cast a white brunette woman since Rae's clearly black. @cienaree I would LOVE to see a Rae Sloane movie! More nuanced female villains, please!